I’m still participating in the March Photo a Day Challenge,but because my Instagram photos feed into the blog widget about 1/3 of the way down the page for your viewing convenience, I’ve decided to post a weekly recap of photos instead of trying to post them here every day. So here are days 2-8 for this year’s challenge, and then below those are the same days for my challenge last year that I never did share on Nikki by example or on NBE’s instagram. I wanted to have a little fun today and share a few facts about myself to help new and long-time readers alike get to know me better. I love finding out silly or random things about others so I thought you might enjoy it, too. For more fun facts, check out 50 Random Facts About Me and another 20 in my Snowflakes and Margaritas post. You’ll laugh, you’ll cry, you’ll have a good time, I’m sure of it. 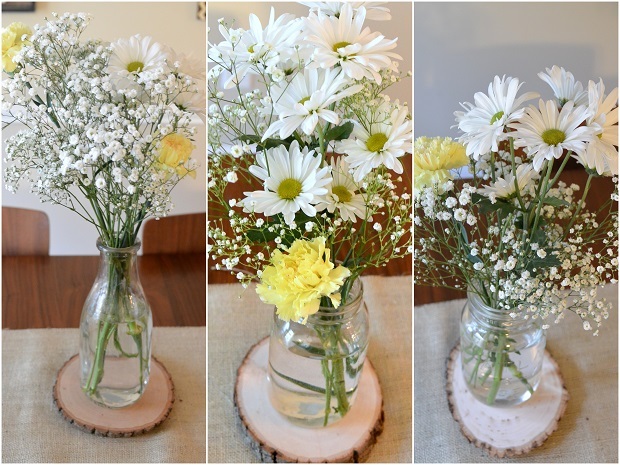 For my baby shower, I made these simple, rustic centerpieces for the food and beverage tables. 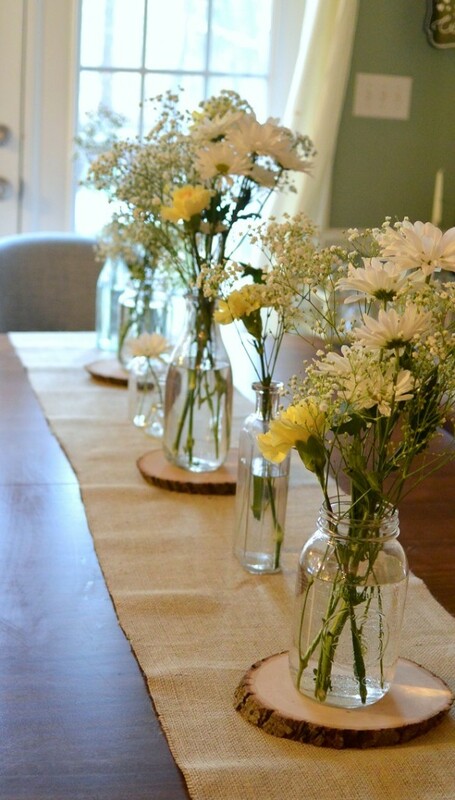 The Mason jars, vases, and burlap table runners are all leftovers from our wedding, and were perfect for decorating our BBQ-themed shower. I love that after 5 years, I could pull this stuff out and use it again. I picked up the wooden rounds at Target and the flowers were grocery store specials. 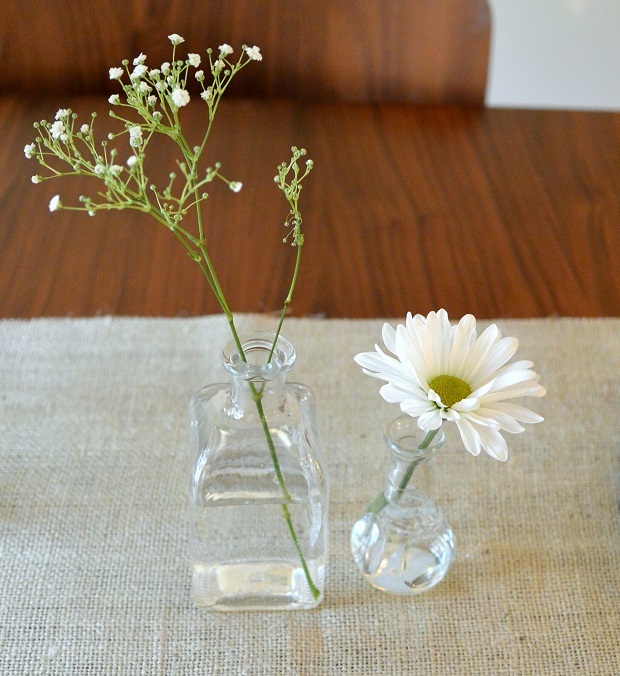 I think simple flower arrangements are the most elegant, so I stuck with one main type of flower and one to two complementing types. 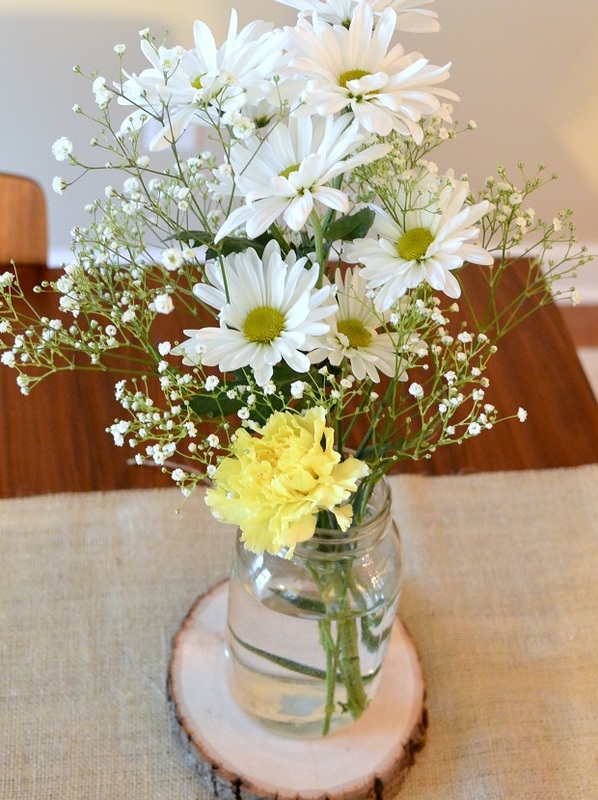 For these, the main attraction is the baby’s breath with the complementing daisy and the small pop of color from the yellow carnation. 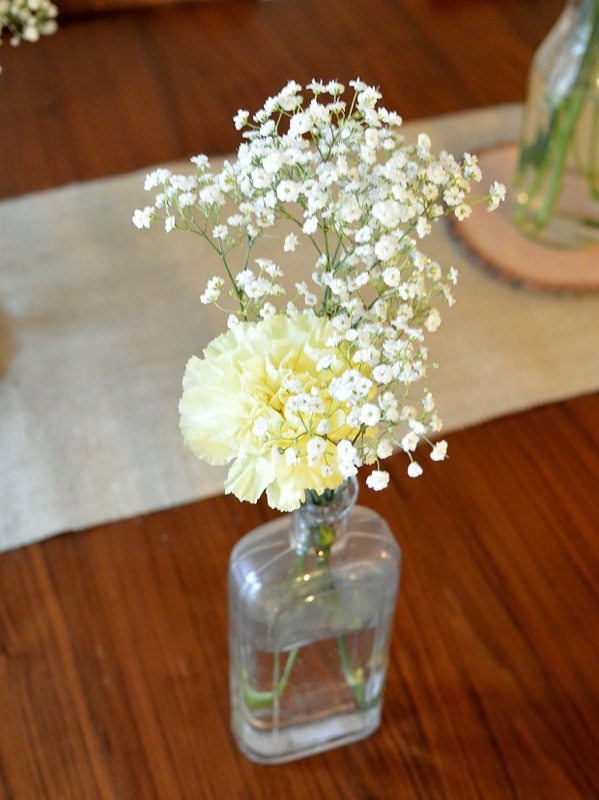 I also think having a few smaller vases with only one or two flower stems added some visual interest and gave off a more casual vibe, which was perfect for our casual shower. I love putting together flower arrangements like these, especially when we entertain, because they make the house feel so cheery and fresh. 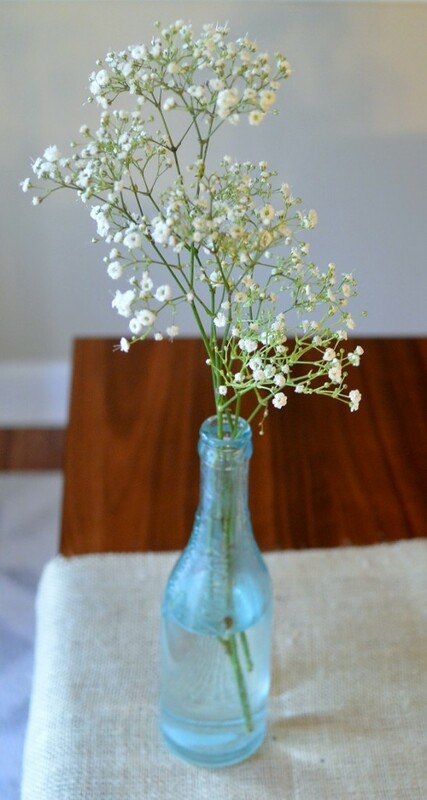 I feel like you can never go wrong with beautiful flowers in a vase on your table or shelf. What do you think? We were invited to a housewarming party and needed a last-minute gift that didn’t cost a ton of money. Luckily, Pinterest always comes through and inspired this gift idea, a spaghetti dinner in an oh-so-useful colander. 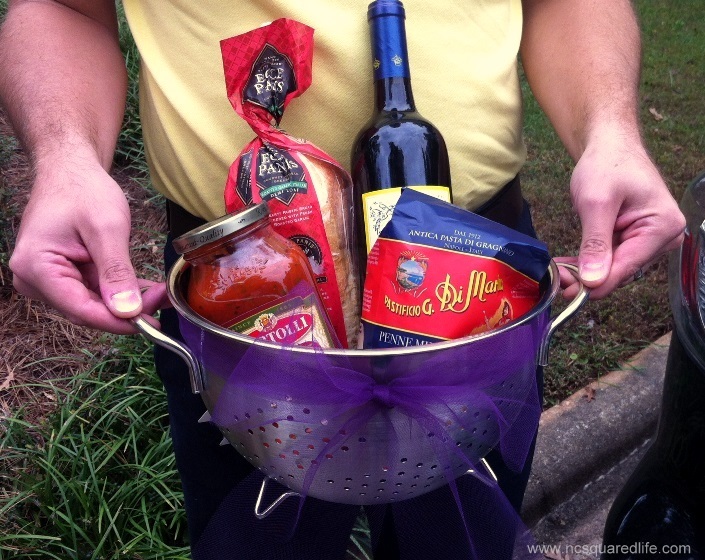 We purchased the colander and filled it with noodles, spaghetti sauce, a small baguette of bread and yummy red wine. Nick is an expert at bow-tying, as you can see, which was the perfect finishing touch. And no housewarming gift is complete without flowers. 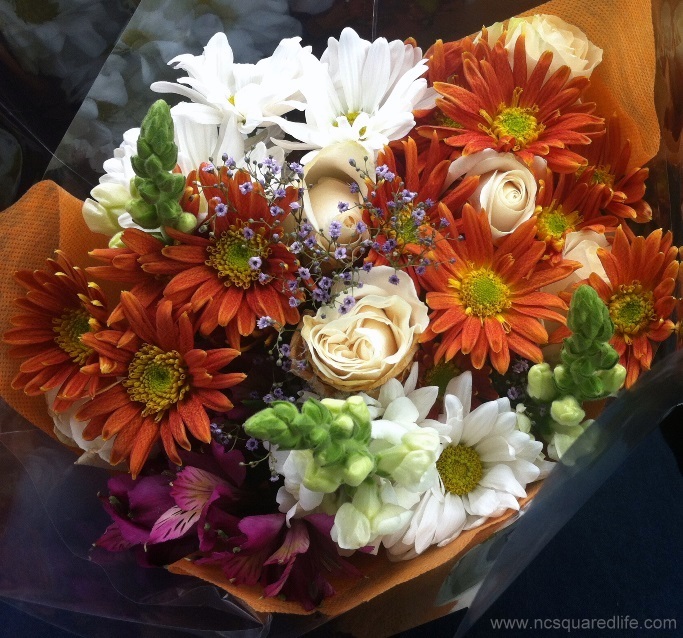 Look at this lovely bouquet! What is your go-to gift when you don’t have much time to plan? 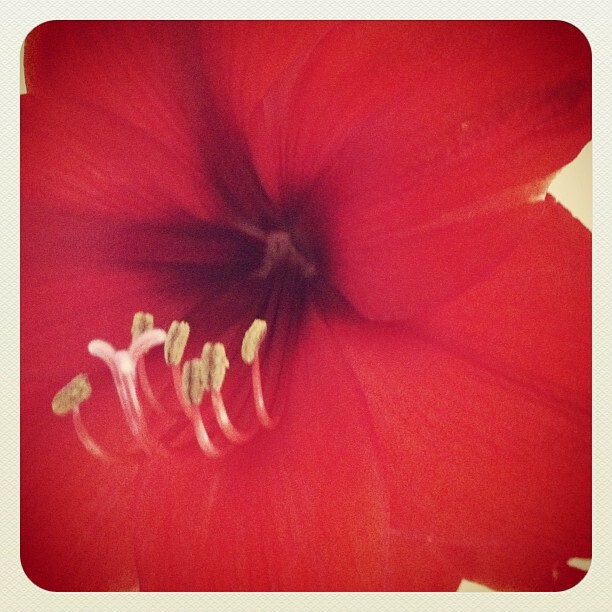 What I like most about this photo, which is of a plant in my kitchen, is that it reminds me of an old postcard.